Dog Haus, the celebrated Los Angeles-based concept known for its gourmet hot dogs, sausages, burgers, and one-of-a-kind creations, will be opening its fifth franchise location in Thousand Oaks on Saturday, February 21st. As part of Dog Haus' introduction to the community, guests will be able to swing by from 11 am to 10 pm on Saturday, February 21st to enjoy a free Haus Dog from a selection of Dog Haus classic all-beef skinless dog offerings, all served up on grilled King's Hawaiian Rolls. Options will include fan favorites like the Sooo Cali with arugula, tomato, crispy onions, spicy basil aioli and avocado; the Downtown featuring a smoked bacon wrapped dog topped with caramelized onions, roasted bell peppers, mayo, mustard, and ketchup; or The Cowboy with white American cheese, smoked bacon, bbq sauce, and crispy onions. To pair with their dogs, diners can order fare from Dog Haus' full menu, which is rounded out with gourmet sausages, burgers, corn dogs, sides, and the debut of the Mötley Bleu 2.0 burger complete with soy-racha onions, bleu sriracha sauce, white American cheese, bacon, lettuce, and tomato. Other Haus items include The Fonz that partners a spicy Italian sausage with pastrami and melted mozzarella; while the Das Brat features a bratwurst with caramelized onions, sauerkraut, white American cheese, and whole grain mustard aioli. Haus Burgers run the gamut from the trademarked The Freiburger® with white American cheese, a fried egg, haus slaw, fries and mayo; to the Holy Aioli with white American cheese, caramelized onions, smoked bacon, and garlic aioli. Lighter eaters and kids can indulge in smaller-sized portions – the Dog slider is made with an all-beef mini dog, haus-made cheese sauce, shredded cheddar and bacon; the Burger slider has just the right amount of caramelized onions, white American cheese, and mayo; while the Corn Dog slider features an all-beef mini dog dipped in haus-made root beer batter. Equal attention is paid to the quality-driven sides, like Chili Cheese Tots or fresh-cut, twice-fried Fries with haus-made cheese sauce, cheddar, haus chili, and diced onions; beer-battered Onion Rings; and Sweet Potato Fries. Our premium desserts including shakes & malts, cookies are a must have to end on a sweet note. To complement the main offerings, diners will be able to select from wine and a thoughtful list of beers available on tap as well as canned, upon opening. The restaurant will boast craft drafts with a heavy emphasis on local breweries, such as Ladyface Ale Companie going by the pint. Those who opt for a canned beer can enjoy options like Moose Drool Brown Ale, Pabst Blue Ribbon and The Dudes Kolshtal Eddy all served up in Dog Haus koozies – a nod to backyard summer BBQs and tailgating. The fast-casual concept, designed to elevate the nostalgic experience of eating that quintessential hot dog or burger, carries that nostalgia over to the aesthetic of the modern industrial space. After ordering at the counter, diners can gather around communal-style tables outfitted with bar stools or at cozier tables made from wood and steel that span the perimeter of the 1400 square-foot restaurant. Striking red and black accents and playful expressions such as “The Absolute Würst” and “Sweet Buns” peppered throughout the restaurant enliven both the interior and exterior seating area of the stand-alone restaurant, bringing a modern sensibility to the classic concept. The new restaurant, located at 50 E. Thousand Oaks Blvd., Thousand Oaks, will be open daily from 11 am - 10 pm. 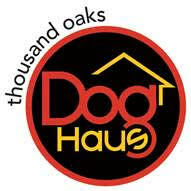 For more information call (805) 497-3644 or visit doghaus.com and follow Dog Haus Thousand Oaks on Facebook at ­­­@doghausthousandoaks to stay up to date on all location specific happenings. Dog Haus is Southern California's craft casual hot dog concept founded by partners Hagop Giragossian, Quasim Riaz and André Vener with a passion for creativity, quality and commitment to community. The first Dog Haus opened in Pasadena in 2010 offering signature 100% all-beef skinless Haus Dogs, Haus Sausages and 100% natural Black Angus beef burgers on grilled King’s Hawaiian Rolls. Open for lunch and dinner daily, guests can choose from signature Haus creations or customize their own from a selection of more than 40+ quality toppings. In addition to its five franchise restaurants, Dog Haus currently operates three-company owned locations in the Pasadena area. For more information visit doghaus.com or find us on Facebook, Twitter or Instagram at @DogHausDogs.